The year is 2050, and we still haven’t destroyed ourselves, the global economy or the planet. Even the world map looks pretty much unchanged, not like the catastrophic projections of the effects of global warming. I emphasize that because one of the points Juma Al-JouJou’s Green Deal wants to make is that it does not go without saying. The only reason we made it that far without history’s worst case of wet feet is that, at some point between now and then, the world governments removed their collective heads from their posteriors and started making and enforcing strict laws to protect the environment. At the same time, consumers decided that having clean air, food and water with a side order of social justice and reasonable working conditions is more important than saving five dollars on a new TV. Companies not mindful of these things see their customers abandoning them. And still, despite all that, large enterprises prosper. Or at least they do if your management skills are up to it, because Green Deal is not a game about saving the planet, it’s a game about making a profit without destroying it. As the manager of a global enterprise, it’s your job to keep everyone happy, customers and government inspectors as well as your stockholders. To do that, you improve your company with sustainable Projects from four different categories: Environment, Jobs, Social and Research. 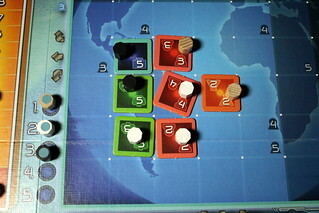 One project from each category is available every round, but no matter how many people are playing, there are never enough projects for everyone: projects remaining when all but one player bought one are discarded – into a recycling facility, not dumped into the ocean – so the last player can never be sure he’ll get one. Naturally, no one wants to be the last player under these conditions. Because of the wide spectrum of costs and benefits in the projects, you actually want to go as early as possible, and the way to sell a limited resource like the first player spot is by auction. First thing every round, players make a hidden bid for player order, the more they pay the earlier they go. (The auction wheel used for this bid is my one complaint about Green Deal‘s components, the pointer is so loose that it’s impossible to turn the things over without inadvertently changing your bid. However, removing the pointer and using a paper clip to mark your bid works very well.) After all players pay their bid and take their income for the round, they each pick one card, usually a Project. Taking a Project doesn’t sound very exciting at this exact point in the game. You take the card and slide a couple of markers along the different scales on the board: adjust your Cash (usually downwards), your Income (also mostly downwards), your Victory Points (mostly upwards, but there are one or two exceptions) and your Sustainability score matching the Project’s type (always upwards). That’s it for Projects – at this point, they get more interesting in a bit – just adjusting some values. If you don’t want a Project this round, or cannot take one, your other option is to pick an Action Card. They may also cost you Cash and Income, but sliding markers around is not all they do. Action cards may have a one-time effect, a permanent one, or they may increase your score at the end of the game. These cards are quite powerful. To give you an idea, there is one that allows you to adjust your bid for player order one point up or down every turn after the bids are revealed. Another can be played to destroy half the cash every player owns. Powerful, useful, but they don’t adjust the scales to score points like Projects do, picking up an Action card you don’t use is a painfully wasted turn. No matter the type of card you pick, you can take two additional actions as well. You can pay a Dividend to your stockholders, paying cash in exchange for victory points, and you can buy a PR Marker, more on those in a bit. After all players had the chance to pick a card, it’s time for the Projects to do something more interesting. For each Project acquired this round, you place a Project Tile of the same type and value on the world map, next to one of your existing project. Doesn’t sound interesting? Then how about this: for each Project Tile of the same type next to your new tile, you choose to cooperate or compete with that project. In cooperation, you add up the two Projects’ values and both owners add half that to their income. Cooperation is a great source of Income, but you end up helping someone else as well most of the time. Alternatively, and only if your new Project has a higher value, you can compete and take the difference between the Projects’ values from the other owner’s Income. The strategy on the world map is quite interesting, you can use cheap, low value projects to boost your Income through cooperation with more expensive projects. But then you have to protect them because they leave you vulnerable to competition and the resulting loss of income. And those considerations still have to be balanced against your wish to score points. For your score, it’s not only important to grab Projects with many Victory Points. They certainly help, but there is more to picking the right Project thanks to the various scoring rounds. Three times during the game, after rounds four, seven and at game’s end after round ten, you score through PR Assessments. 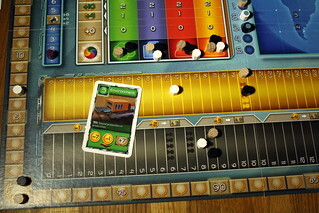 The player with the highest rating on each of the four sustainability tracks scores 8 points, second and third place get 4 and 2, respectively. But few things are ever as simple as that, it’s called a PR Assessment because you can still influence the public opinion before scoring. This is where the PR Markers mentioned above are important. All players secretly assign their Markers, valued from one to three, to the four Project types and those points are added to their ratings before comparing. You don’t actually adjust your rating – this is public relations, not doing anything useful – but good PR and some bluffing are sometimes more important to score than real work. After rounds six and ten, there is a Sustainability Assessment, rewarding players for a balanced Project portfolio: you score points based on your lowest ranking on the sustainability tracks, the higher the better. Finally, when the game is over, players score points based on their Income, where obviously higher is better. One scoring where you want to be high in some rankings, another where you want to have some progress in all of them, all that while keeping your enterprise profitable and keeping an eye on your position on the world map, those are quite a few conflicting interests you need to balance. In only ten rounds, your options to do something about that are very limited, making every decision important. One thing you won’t find in Green Deal are decisions that don’t matter, you simply can’t afford to waste a turn doing something unimportant. And if you find yourself with nothing useful to do for a turn, you only have yourself to blame, for instance because you bid too low for turn order. There is virtually no luck involved in Green Deal, even the cards for next round are visible. That’s more than just a nice side effect of them being bilingual, with English text on one side and German on the other, it also lets you adjust your strategy accordingly when you see something valuable coming up. To play well, make good use of this look into the future. I’ll be honest, there were two things that had me worried about Green Deal. The first is the theme, because there are some games about the environment and sustainability with the only purpose to preach, often omitting the actual game part. Not so in this one, those subjects are always visible on the Project cards but stay strictly in the theme of the game. Green Deal doesn’t preach, it merely shows, and it certainly includes a game with it. 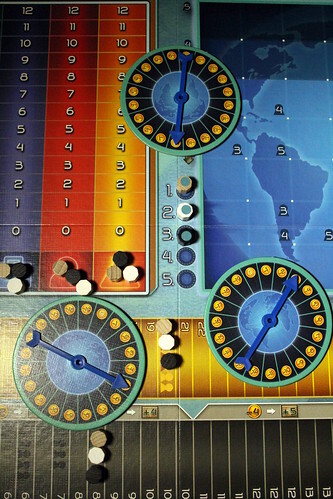 My second worry, after seeing the game board that consists mostly of tracks to adjust your various markers on, was that it would be an incredibly dry affair. That worry was fortunately unfounded as well. While you do move around on those tracks a lot, there’s nothing dry about Green Deal. Balancing your Cash and Income against Points, your position on the sustainability tracks against what you need on the world map, the value of an Action card against the Project that you could build instead, all those are tense decisions with big consequences. There’s also the spatial strategy on the world map, and there’s a good deal of guessing and bluffing in the turn order auctions and PR Assessments. 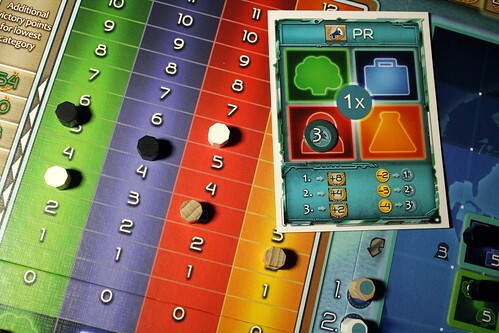 Despite all those different elements, Green Deal is an easy game to get into. Even players that were confused after the explanation didn’t have any issues after the first round of play. No single element of Green Deal is complex, but they fit together to make a very compelling, strategic game with a great amount of player interaction. P.S. : If you already own Green Deal, or plan to purchase it soon – at the Essen fair, for instance – you will have to download the correct rules from this link. Due to a packaging issue, the box contains an older version of the rules. A game about global warming and green energy, so many things could potentially go wrong with that. It could be dry and boring. It could be preachy. It could be trying to be educational. Or it could be great game of economy and strategy where you have to balance your profits against the possibility of global environmental disaster. Which one is CO2?